Winter can get pretty intense here in the Hudson Valley – which is a big reason why so many of our customers turn to the proven heating power of propane gas when the temperature dips. But as a propane customer, you have some special considerations to keep in mind during the cold weather months, especially before, during, and after winter storms. Be sure to follow these six tips to keep your family – and our delivery crews – safe during heating season in your propane-powered home. Mark your tank – Attach a colored flag to the top of your tank so our delivery crew can find it in any weather; a flag also helps the driver to safely and most effectively position his truck for your delivery. Clear a path to the tank – Snow and ice can make it difficult to reach your tank for proper maintenance, gas level monitoring, and refilling; make sure you keep a path cleared to your tank. Remove snow from your tank – Once you clear a path to your propane tank, switch to a broom to clear snow and ice from the tank itself; using a shovel for this purpose could puncture your tank and cause a propane gas leak. Check vents and flues – Clear flues and vents regularly to prevent a build-up of carbon monoxide (CO) in your home. If you haven’t tested your CO detectors or replaced your CO detector batteries yet this year, do it right away. Keep an eye on propane levels – If you are not an automatic propane delivery customer, keep a close eye on your propane levels throughout the winter – especially during a cold snap when you will probably use propane more quickly than you realize. Call when your tank is no less than one-quarter full; the colder it is, the busier our delivery crew gets, so don’t wait until the last minute to contact us for a propane delivery. Know how to respond to a propane tank leaks – Always keep a nose out for a propane leak – it will smell like rotten eggs. If you detect that odor, follow propane safety procedures immediately. 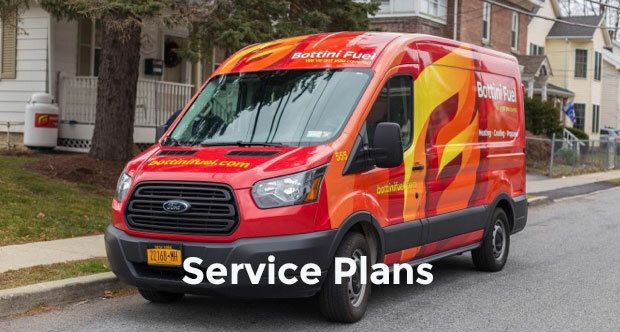 Be prepared for any weather this winter with expert heating system service and reliable propane deliveries from Bottini Fuel. Contact us today to learn more, or to become a Bottini Fuel customer.